Over the last couple of years, the refugee debate has been dominating the media. Firstly centred on those coming, but lately more focused on those who are already living here. The question that emerges is about definitions of Danish-ness and foreign-ness. 100% Foreign? has invited 100 citizens, all former refugees, to respond to this question. Do you feel 0%, 50%, 100% foreign? A simplified and polemic question, which has led to 100 extremely different conversations. These have been edited into 100 stories and staged portraits where the former refugees are centre stage. Who are they, and what is on their minds? 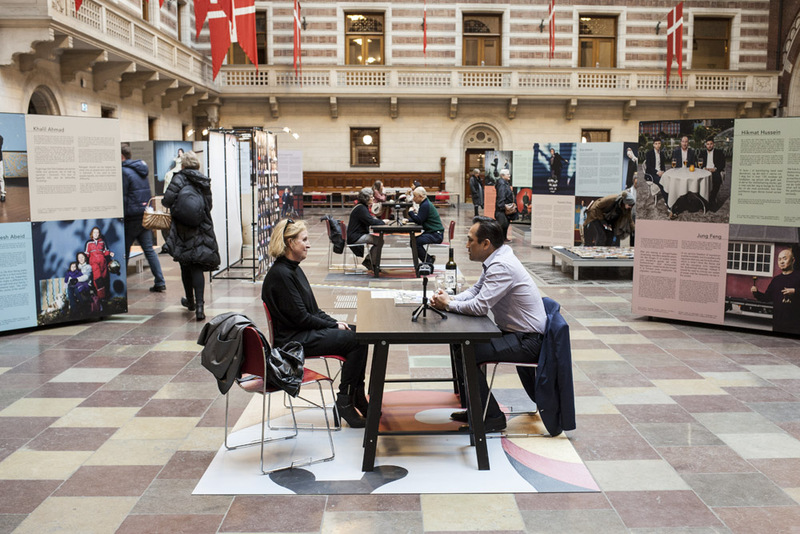 The stereotype story of refugees is replaced by 100 personal and diverse life stories about being a citizen in Denmark today – foreign or not. Stories of belonging, longing and dreams, memories of people and places, views on society, gender, culture and religion. 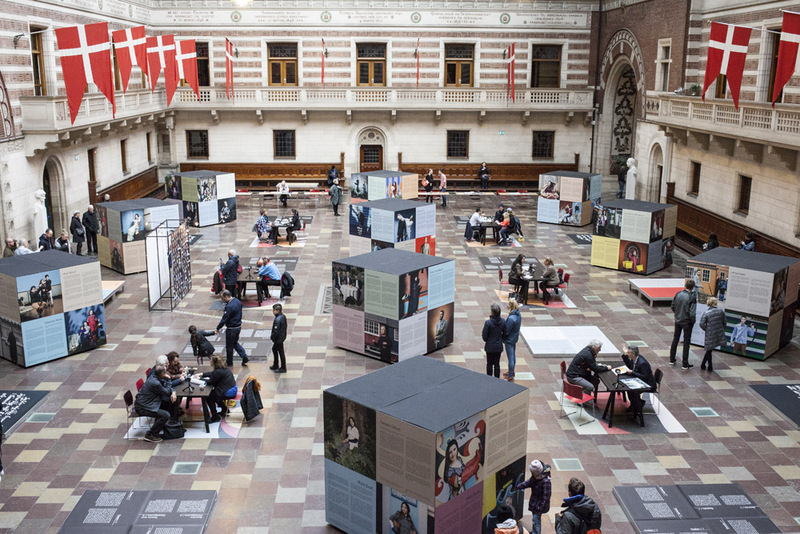 The 100 participants have been selected on the basis of data from Statistics Denmark to be representative of the 161,000 people who have been granted asylum or family reunion in Denmark since 1956, primarily from 29 countries – all of them arriving after the UN adopted the Refugee Convention in 1951. Participants are selected on criteria of country of origin, year of arrival, and gender, but also on the basis of softer criteria such as political standpoint, religious belief, ethnicity, and professional background in order to ensure diversity. 14% are from Iraq, 11% from Afghanistan and Syria, 7% from Iran and Somalia, but also former refugees from countries such as Poland, Russia, China, Burundi, and Chile are represented. The oldest participant is 79 years old and came to Denmark as one of the first refugees from Hungary after the Soviet invasion in 1956. The most recent participant came in 2016 as a result of the Syrian Civil War. In this way, 100% Foreign? reflects with broad brush strokes 60 years of local and global crises. The participants have been involved in the process of defining the formats and the precise content of their self-representation both with regards to the photographs and the texts. Some topics and experiences have been too traumatic or even dangerous to be explicit, and these are just touched on. Three of the participants wish to remain anonymous. All the portraits have been staged in Tivoli Gardens, a national symbol of fun, freedom and escapism. With Tivoli’s myriad of colours, symbols and materials as a background, the portraits are freed from the stereotyped social realism, which often keeps the narrative of refugees as victims of their own situation. The amusement park acts as an old-fashioned photo studio where the participants dress up, select their own background, and bring close friends, family members, or objects, which are meaningful. The staging of the photographs attempts to connect the personal stories with Tivoli as a scenographic and mental landscape, between fiction and reality. The narratives are brought alive in collaboration with ten theatre directors, who act as mentors supporting the participants to translate their stories into short monologues. 100% Foreign? attempts to build a living archive, a temporary citizens platform in constant development, which adds a new and missing narrative to the on-going story of Copenhagen and Denmark. This is the first large scale art-documentary collection of material from this disparate community of citizens’ personal lives. The 100 stories will be transferred to Copenhagen City Archives to start up a new and more representative contemporary archive. 100% FOREIGN? is produced by Copenhagen International Theatre in collaboration with curator/photographer Maja Eriksen. It is the second project based on the concept of Rimini Protokoll. 100% Copenhagen was the first, where a statistical and empirically rational representation of a community of citizens is challenged by 100 individual stories, where averages and generalisations are confronted. 100%FREMMED? in Copenhagen City Hall april 2017. 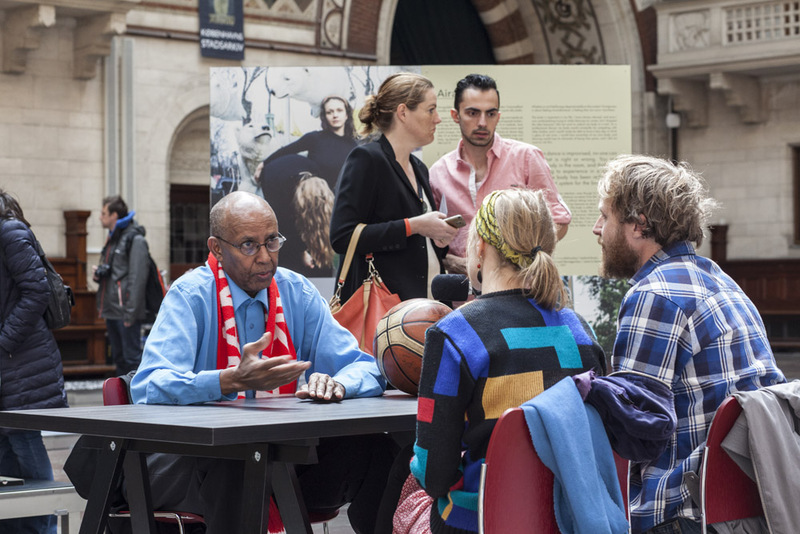 Over the duration of a weekend the exhibition came to live, as the participants told short stories and got into discussions with the public - A living archive in a one to one setting of non stop dialogues.